This mosaic of the Saturn system, taken by Cassini, glows with scattered light from tiny dust grains. The sun is obscured by the planet in this unusual geometry. The rings of Saturn have been known of since telescopesbegan peering at the heavens. Galileo first spotted them in 1610. Since thattime, astronomers have learned more and more about Saturn's most strikingfeature, from the material that makes up the rings to the forces that jostlethat material around. But two of the most basic-sounding pieces of informationabout Saturn'srings ? their mass and age ? remain something of a mystery. These questions are "the big elephant in theroom," said Jeff Cuzzi, interdisciplinary scientist for rings and dust forNASA?s Cassini spacecraft. Cuzzi is based at NASA Ames Research Center inMoffett Field, Calif.
Astronomers hope that this mystery will be solved, or atleast better understood, with the help of NASA's Cassini spacecraft, which has spentthe last six years exploring theSaturnian system. Cassini is now in its extended mission, and has severalmaneuvers and observations planned that scientists hope will help settle thequestions of just how old Saturn's rings are and how much material is in them. For decades, astronomers had thought that the rings ofSaturn, like the planet they orbited, had formed when the solar system did some4.6 billion years ago, and so were as old as the solar system was. This notion was challenged when NASA's Voyager spacecraftflew by the ringed giant in the early 1980s and gathered data on the planet,its many moons and its ring system. Through the Voyager observations,scientists found that complex processes were going on in the rings "thatmake it very hard to understand how [the rings] could be that old," Cuzzitold SPACE.com. These processes involve the gravitational pushes and pulls,called resonances, that Saturn'smoons and rings exert on each other and the cascading effects that thoseresonances have on other physical processes in the rings. Essentially,scientists worked out, these processes should push Saturn's small moons out ofthe ring system and pull the rings in toward the planet. But if the ring systemwas as old as the solar system, this should have happened long ago. "The processes are going so fast that they would be allfinished ? the rings would be gone," said Larry Esposito of the Universityof Colorado at Boulder, the principal investigator of Cassini's UltravioletImaging Spectrograph (UVIS) instrument. Given the rate at which these processes operate, and thecurrent position of Saturn's rings and moonlets, scientists calculated that therings would have to be one-tenth as old as old as the solar system, or only acouple hundred million years old, Cuzzi said. But the Voyager flyby data were just snapshots of the Saturnsystem. When Cassini arrived at Saturn in 2004, its observations showed thatthe processes churning up the rings were going at an even faster rate than wasindicated by the Voyager data, Esposito told SPACE.com. Adjusting the age ofthe rings accordingly would make them younger than the Voyager exploration era,clearly an impossibility. So the idea that the rings are much younger than the solarsystem "seems to me to be suspect at this moment," Esposito said. Though there is another, independent line of evidence thatsuggests that the rings are a young feature ? the amount of pollution in themostly water-ice rings that comes from incoming meteorite debris. The ringsof Saturn are at least 90 percent water ice, observations have found. But,like other things in the solar system, Saturn's rings are under constantbombardment by interplanetary debris, which is about 60 percent carbon androck, Cuzzi said. Over time, the meteorite debris raining down on the ringswould "pollute" the water ice, making it increasingly less pure. "Over time, [the rings] are getting dirtier," Cuzzi said. But thebulk of the rings are still largely water ice, suggesting that the ringshaven't been around long enough to be highly polluted, which in turn suggeststhey're rather young. Of course, how dirty the rings get doesn't depend only onhow long they've been around to absorb all that debris; it also depends on howmuch ring material there is. The pollution wouldn't show up as much in denser,more massive rings as it would in thinner rings. So knowing the mass ofSaturn's rings could help scientists figure out how long debris has beenbombarding them, and therefore how long they've been around. "We thought we knew the mass of the rings prettywell," Cuzzi said. Scientists, including Esposito, had determined thismass by measuring how much starlight gets through the rings. But Cassinidiscovered that the material in the rings exerts a gravitational force onitself that causes it to clump up, and almost no starlight penetrates theseclumps. "So there's really no way for us to know how muchmatter is in these clumps," Cuzzi said. The mass that scientists wereactually measuring was just the mass of the thinner patches between the moremassive clumps. Scientists hope that Cassini can get around this clumpproblem by measuring the mass of Saturn's rings in a different way. Toward the end of its mission, Cassini will be put into anorbit between the planet and the inner edge of the rings. "It's going to go in a very, very close orbit,"Cuzzi said. "And in these orbits, even the mass of the rings has an effecton the orbit of the spacecraft." 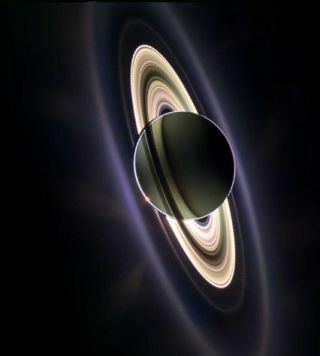 So based on how Cassini's course deviates, scientists hopeto be able to calculate how massive the rings are. The other part of the equation that would give scientists aconstraint on the age of the rings is the rate at which meteorite debris ishitting the rings. Combining the mass of the rings, the amount of pollutionseen in them and the rate at which that pollution falls would tell scientistshow long the debris had been falling on the rings and therefore how long therings have been around. Cassini is also trying to answer that second part of theequation. Measuring the flux of meteorite debris into the rings turns out"to be very hard to measure because the system is a very dusty system anda lot of this is just lost to the background," Cuzzi explained. "Sowe're going to use a bit of trick." The same meteorite debris that falls onto the rings alsofalls onto Saturn's moons. When that debris hits the small, icy moons, it kicksup dust that can be measured by Cassini. That data in turn can tell scientistshow much meteorite debris is falling on the system. The spacecraft recently flew by Saturn's moon Rhea, andscientists are awaiting the data to figure out the meteorite flux, Espositosaid. Once all the data from theCassini mission is in, they hope to combine the calculated mass andmeteorite hit rate "and really be able to say whether the rings are as oldas the solar system or not," Cuzzi said.